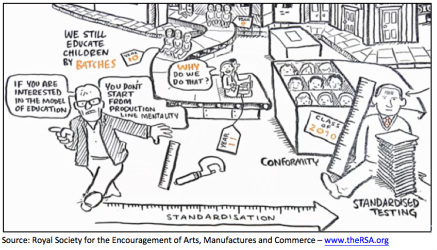 Today's public schools remain heavily influenced by the production line mentality of the industrial era. However, reform measures under consideration at the state and local levels seek to improve student outcomes through innovation and accountability. ​Read both articles for the topic you choose, and complete a precis for each. After closely examining each viewpoint, be prepared to articulate your position on education reform. Closely read both articles under your chosen topic , and write a precis for each following the guidelines and rubric below. This should be shared (as directed in class) Monday, November 12th. Provide FBI (Full Bibliographic Information) for the article. This is the type of entry that you would put onto the Works Cited page of a research paper. The FBI should be copied and pasted exactly as it is typed below. If you forget how to do this utilizing other resources, then use this link to remind yourself. Summarize the article. The summary should be no more than fifteen lines typed. Focus on the big picture that is presented, making sure to include the author's primary arguments. Respond to the article. Make a claim that can be argued. Support your claim logically with evidence from the text, as well as from other sources of information and conjecture to help support your position. Your response should be no more than one page long. Be precise. Need more information? Take time to review Exemplar One and Exemplar Two, and the rubric below. You can also check out Mrs. Trentanelli's sample document, which includes proper MLA set up, as well as an article summary and an FBI notation. Cites excellent and thorough text evidence that clearly identifies the author's thesis and all of the author's arguments, as well as the author's evidence in support of his/her argument. Cites strong and thorough text evidence which identifies the author's thesis and most of the author's arguments, as well as the author's evidence in support of his/her arguments. Cites text evidence which identifies the author's thesis and some of the author's arguments, but may not fully examine the author's evidence in support of his/her arguments. Attempts to or does not cite text evidence, and may not accurate identify the author's thesis. Attempts to or does not identify the author's arguments. Establishes a thought-provoking and/or controversial thesis in response to the author's argument. Introduces precise, knowledgeable and significant claim(s) and draws it back to the thesis. Produces sophisticated writing in which the development, organization, and style are appropriate to the task, purpose, and audience. Establishes a clear and thorough thesis in response to the author's argument. Introduces precise, knowledgeable claim(s). May or not explicitly draw it back to the thesis. Produces clear and coherent writing in which the development, organization, and style are appropriate to task, purpose, and audience. Establishes a thesis in response to the author's argument, but it is either simplistic or unclear. Produces writing in which the development, organization, and style are appropriate to task, purpose, and audience. Attempts to establish a thesis, but it is unclear. Produces writing, however the development, organization, and style may not be appropriate to the task, purpose and audience. Issue/problem to be considered is stated clearly and described comprehensively, delivering all relevant information necessary for full understanding. Gathers sufficient, credible, relevant information: observations, statements, logic, data, facts, questions, graphs, themes, assertions, descriptions, etc. Includes info that opposes as well as supports the argued position. Distinguished between information and inferences drawn from it. Thoroughly analyzes own and other's arguments. Views information critically. Considers multiple diverse perspectives drawn from texts, classroom discussion, and experiences to draw conclusion. Issue/problem to be considered critically is stated, described, and clarified so that understanding is not seriously impeded by omissions. Gathers sufficient credible, and relevant information. Includes some information from opposing views. Distinguishes between information and inferences drawn from it. ​Identifies own and other's arguments. Seeks out information. Considers some diverse perspectives drawn from text, class discussion, and experiences to draw conclusions. Issue/problem to be considered critically is stated but description leaves some terms undefined, ambiguities unexplored, and/or backgrounds unknown. Gathers some credible information, but not enough; some information may be irrelevant. Omits significant information, including some strong counter-arguments. Sometimes confuses information and the inferences drawn from it. ​Partially identifies own and/or other's arguments. Assumes information is valid. Considers only few perspectives drawn from text, class discussion , and experiences to draw conclusions. Issue/problem to be considered is states without clarification or description. Relies on insufficient, irrelevant, or unreliable information. Fails to identify or hastily dismisses strong, relevant counter-arguments. Confuses information and inferences drawn from that information. Attempts to or fails to analyze own and other's arguments. Does not understand the purpose of the information provided. Limited consideration of sources to draw conclusions.